Plant Growth Regulators Market size was more than USD 5 billion in 2017 and will witness 8.5% CAGR during the forecast timespan. Increasing investment in agriculture sector across the globe shall be fueling the plant growth regulators market in the coming years. Commercial crops and fruits & vegetables are major application segments in market. The increased production of these application segments is likely to propel product demand over the forecast period. For instance, according to the United States Department of Agriculture (USDA), the U.S. pulse and vegetable production in 2016 was over 60 million tons and is projected to grow further in the coming years. This massive size of the industry and significant production growth shall propel the plant growth regulators demand over the forecast timespan. Growing organic farming trend driven by increased organic products demand across the globe is poised to create plant growth regulators market demand in the next few years. In addition, growing awareness about health and fitness is likely to help it to grow further. plant growth regulators are considered as organic compounds. Total area under organic farm in Europe was more than 12 million hectares in 2016 and expected to grow with a healthy CAGR. Plant growth regulators are highly recommended to be used in organic farming as a substitute of synthetic chemicals. Inhouse gardens and farming trend has been increasing at substantial growth rate from last several years and shall grow further during the forecast period. People are developing gardens with various varieties of plants and trees for gardening as well as decorations. With rising interest of people towards decorative farming and gardening, plant growth regulators market size will experience a surge in demand over the forecast timespan. Low awareness among the masses about the product application and benefits shall have a slow rising product demand for initial few years. Proper guidance is required to farmers about the product usage and benefits. Misuse of it may result into excessively fast crop development. This can lead to the ripening on the fruit surface while core remaining raw. It will degrade the fruit vegetables quality. This disadvantage to crops is likely to hamper the plant growth regulators market growth in near future. 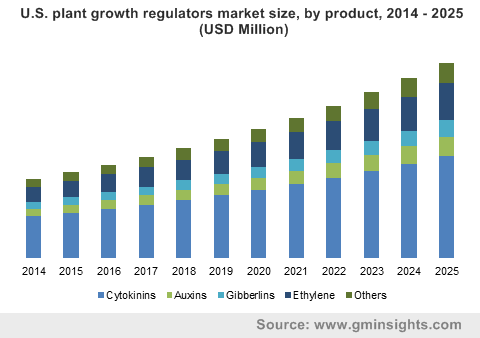 Cytokinins segment recorded the largest plant growth regulators market share in 2017 and anticipated to hold industry share over the forecast period. This can be attributed to its applications which makes it useful in cell division, dormancy breaking, delay in senescence and works as a growth stimulant. Moreover, cytokinins are used in major crops, which are produced across the globe, such as rice, wheat, barley, soybean and maize. Ethylene is projected to experience a prominent CAGR during the forecast period. This can be attributed to the high usage of the product in fruits market. It is majorly used for fruit ripening. Fruits & vegetables application segment created the highest plant growth regulators market demand in 2017 and is anticipated to grow with highest CAGR during the forecast period. Global population is increasing at a rapid rate and with increasing population, demand for food increases drastically. To increase the production of fruits and vegetable, product usage in this application segment will grow substantially over the forecast duration. In addition, most of the plant growth regulators are organic, due to which its usage in the fruits & vegetables application is increasing. Europe registered highest share in plant growth regulators market in 2017. Consumer awareness about the product usage and benefits is high in the region. In addition, disposable income of consumers is high in this region which implies increased investment in farming and related sectors. Commercial crop production is also high in this region and compared to the other crops, thus product usage in the commercial crops is high. 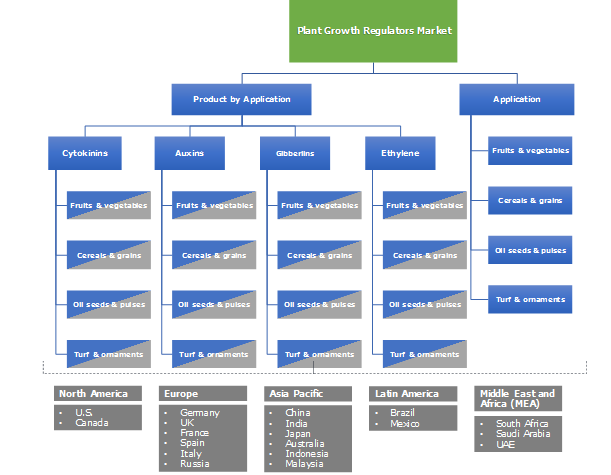 Asia Pacific plant growth regulators market shall experience the highest CAGR during the forecast timespan. This can be attributed to the increasing product knowledge among users and government’s favorable agricultural policies for farmers and agriculture practitioners in this region. Governments in this region are spreading information about usage and benefits of plant growth regulators to facilitate the production and enhance yield. Asia Pacific has a good number of agriculture dependent economies, which implies products such as plant growth regulators will be highly beneficial for enhancing farm productivity in this region over the forecast period. Many multinational giants are operating in the plant growth regulators market. Some of the major players operating in the industry include BASF SE, DowDuPont, Syngenta AG, Bayer AG, Nufarm Limited, Nippon Soda Co., Ltd., Tata Chemicals Ltd, Valent Biosciences LLC, Adama Agricultural Solutions Ltd and Arysta Lifescince. Players in the industry are involved in mergers and acquisitions to increase their consumer base. For instance, in November 2017, Nufarm Limited announced to entered into a binding agreement to acquire a European cereal broadleaf herbicide portfolio from FMC Corporation (“FMC”) for USD 85 Million. This acquisition intends to increase Nufarm’s presence in Europe. Plant Growth Regulators are used to enhance the physiological response of the plants. It can translocate the concentrated plant part and help to increase the availability and supply of the primary nutrients to the plants. It promotes the development & growth in plants including formation of flowers & leaves, elongation of stems and development of fruits. The product is majorly used to meet the food nutrient supply to the plant. It enhances the product quality and marketability. The product finds application in fruits & vegetables, cereals & grains, oil seeds & pulses and turf & ornaments farming. From last several years they have become an integral part of agriculture.